DO TERMITES EAT POOL LINERS? TERMITES WILL TARGET ABOVE GROUND POOLS TOO! WHY DON’T POOL INSTALLATION COMPANIES OFFER SOIL TREATMENTS TO PROTECT POOL LINERS? HOW MUCH CHEMICAL WILL BE NEEDED TO TREAT YOUR POOL LINER FOR TERMITES? Termites are a problem found in just about any region of the world. They are largely responsible for the bulk of recycling that occurs naturally; termites are arguably the largest recycler of wood (cellulose) and without them, earth would be in trouble. They are clearly an integral part of the ecosystem; however, their ferocious appetite and constant search for wood and water leads them on a path which many times conflicts with man. The focus point of this article will be when termites target pools, specifically pool liners and pool structures. Termites spend most of their time targeting cellulose (known as wood) and water. These are the two ingredients needed by any termite colony. There are many places where termites will find both wood and water including structures, forests and the general landscaping around most any home. In the yard, swimming pools can be such an area. Most pools have the two ingredients termites need to survive and will become the main target of any termite colony if given the chance. This could happen anywhere a pool is installed but it seems to happen more in arid regions or when any one region is experiencing a drought. During dry times termites get desperate for moisture and will target any body or source of water the sense. 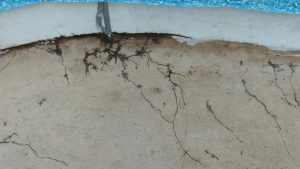 POOL DESIGN AND TERMITES; DO TERMITES LIKE ONE POOL OVER ANOTHER? There are many types of pools. Pools made of cement, gunite and other solid materials similar to rock are generally not going to have problems with termites. Pools which utilize any type of liner can and this will include both in ground and above ground designs. In ground pools can have a lot of wood involved in the construction but there are those which use little to no wood. Above ground pools usually have little wood involved but tend to have a lot added in the shape of decks, walk ways, stairs and supporting framework to house such pool necessities as equipment and filters. Any type which uses a liner is susceptible to termite damage; pools which use both wood and liners have the two ingredients termites spend their lives targeting. In ground pools typically have some wood beams installed which are laid in the ground. Liners are set over these foundations and though the wood used will many times be pressure treated or impregnated with some type of protective chemical, such treatments will break down over time. This breakdown, combined with the moisture wood will typically absorb from the ground, are the core ingredients of a good termite “recipe”. In ground pools which don’t utilize wood but instead have chosen all man made supplies are equally at risk as well. Termites will be drawn to these structures because of the water or termites will find them by mistake. Since termites almost always have some part of their colony foraging on a “seek and find” mission for both food and water, in ground pools can’t hide even if they are made with all synthetic material. Their thin liners are not enough to hide the water which lies inside. Termites will detect the water and target any weak part of a pools design. But do they actually eat the liner? No. But they will chew through it to get to the water stored on the other side. 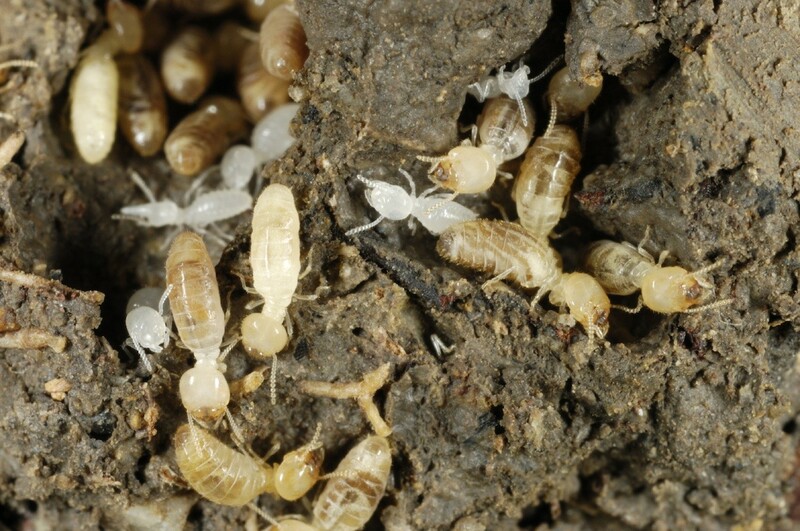 As our on line article about termite biology describes, most any active termite colony will have thousands of termites out and about seeking moisture and new food supplies – even when the colony already has ample supplies. This is one of their natural defenses and allows them to have “priority” supplies so that when main targets are lost, lower priority water and wood are at hand and can be farmed. This constant search will inevitably bring some termites to find most any in ground pool at some point during the pools existence. Termite eaten pool liner. This was discovered after liner was removed. Termites ability to detect water – even through thick pool liners – will initiate an interest toward an in ground pool. If they desire or need the water bad enough, they will chew their way through the liner which in turn will cause water leaks. Slow at first, water loss will almost be non-detectable. However, most termite harvesting of water will tend to increase and as more and more access holes are created, water loss will be fast and noticeable. Left to bore as they please, the water loss will be so bad the liner will have to be replaced. Many people believe termites “ate” their liner when in fact the termites really “ate through” the liner (at this point we don’t think termites are able to digest and convert plastic to food – at least not yet!). Above ground pools aren’t ignored safe either so don’t decide to install one thinking it will be termite proof. In fact, above ground pools have many problems which are unique onto themselves. First, their liners will come in contact with some ground. This usually is the bottom or floor of the liner. Foraging termites will readily find these contact points since they tend to forage just below the surface of the yard. The fact is that termites in any colony whose job it is to seek out and find water and cellulose will many times follow shallow pathways stay in the same range of most above ground pool liners making them especially vulnerable. This is probably an instinctive behavior formed over the thousands and thousands of years termites have foraged and found wood. Furthermore, above ground pools commonly have wood decks installed which will become a strong termite attractant. Pool filters, back washing and common maintenance routines done around above ground pools almost always involve water. This constant supply of water will create damp, moist areas which termites love. And don’t think the chlorine in the water will kill off or repel termites either; any chemical present when the water first finds soil will dissipate within a few hours. In other words, don’t be surprised if termites show up around your above ground pool in the form of a swarm or just armies of white workers who are targeting any little piece of wood they can find. Such areas are ideal for termites and they will readily move onto them once found. From there it won’t be long till they chew through the pools lining. In summary, termites don’t discriminate between in ground or above ground pool design; they seem to like it all and anywhere water and wood can be found. Worth mentioning is the impact any plant growth can have under lining or in the framework of in ground pools. Plants are strong and if the right amount of water finds seeds which are buried under a liner, there is a chance the seeds could grow. This growth generally won’t lead to anything and most any seed that does get a chance to sprout growth will die off without sun light or other important variables. However, there are many hearty and persistent weeds which don’t give up easily. If pools – more importantly pool liners – are installed during late winter, early spring or early summer months, there is always a risk of plant growth damage. Though not common, there are many types of weeds which are more then strong enough to poke holes through any liner. So if you are installing a new pool or replacing an old damaged liner, be sure to read through the next section of this article. It will explain what steps are needed to insure you won’t get any unwanted plant growth or termite chewing under the new liner you are about to lay down. As explained above, the act of installing a pool is usually a good enough reason for termites to come around looking to cause some damage. If you are in a region with a lot of termite activity or moisture, this risk is even greater. Furthermore, most regions which have a lot of moisture usually have a lot of plant growth. Since termites and plants can and do cause all kinds of problems for in ground and above ground pools, it makes sense to do a little preventive treatment to make sure they don’t. And the extra cost to termite and weed proof the ground on which any pool will sit is small compared to the cost of pool repair. In fact so small is this cost that anyone installing a pool for the first time should invest the extra time and effort needed to get these treatments done. Don’t expect the company installing your pool or liner to offer a soil treating service. Remember, they are in the business of replacing damaged pool parts – not stopping it from happening! Though there are a few companies who offer some type of protection for these two concerns, most don’t even mention it can happen till a few years later when you call to get a new liner. Expect to hear about it then, when its long too late, and the damage has already happened. So if you want to prevent plant growth damage or termite damage from ever happening to your pool liner, there are two materials that can be applied to the soil which will safeguard this important investment. First, it is necessary to get a good measurement of the amount of square feet that will be touching the pool liner and supporting framework. For an above ground round pool, which only has its bottom sitting on the ground, the formula for making this measurement is: Pi * r^2. “Pi” has the rounded off value of 3.14 and “r” represents the radius of the pool. This will be 1/2 the width. To make it simple, follow this example using a 18 foot round above ground pool. An above ground pool, 18 feet wide, has a radius of 9 feet. First, square the radius, which is 9 x 9 or 81. Next, multiply 3.14 times 81 and you will have the area of liner touching soil of approximately 255 sq/ft. Now in this second example, lets say the pool is still above ground but not round. Instead its 18 feet wide by 36 feet long. In this example, just multiply 18 x 36 and you’ll get the area of liner touching soil which will be 648 feet. Lastly, for in ground pools, it is important to calculate the bottom but you’ll also need to include the sides. Most will have four sides but pools which have a side or two above ground are common and any side not touching soil should not be counted. So lets say you have an in ground pool measuring 18 x 36 feet. That means you’ll have 648 feet of “bottom” side to treat. Now lets say it will have an average depth of 4 feet. Well that means you’ll need to take the square footage of each side and add that to the total. So each of the 18 foot sides will have 72 square feet and the 36 foot sides will have 144 feet. That means you’ll have 684 + 72 + 72 + 144 + 144 which equals 1116 sq/ft. Now if you need help calculating this value, just give us a call or fax us the swimming pool dimensions so we can help by making the calculation for you. To best protect your pool liner, you’ll want to use a repellent chemical. Many of todays termiticides are “non repellents” which won’t work for this type of job. Non repellents are chemicals which termites don’t notice so if they find the pool liner, they’ll go about their business with no care or concern. That means they’ll generally do plenty of damage before the non repellent kicks in and by the time it does, it will be too late for the liner. So to make sure termites stay away, treat with CYPERMETHRIN. Termites hate this stuff and will avoid anywhere its been applied. And since treatments can last over 10 years, it will provide protection for the life of most any pool liner. 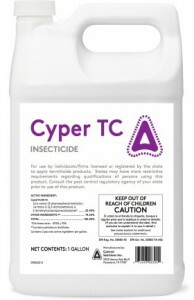 Cypermethrin should be applied at the rate of 1 gallon per 10 sq/ft. A gallon jug of Cypermethrin mixed with 50 gallons of water and can treat up to 500 sq/ft of soil. Use a 20 GALLON HOSE END SPRAYER to insure you use enough water. 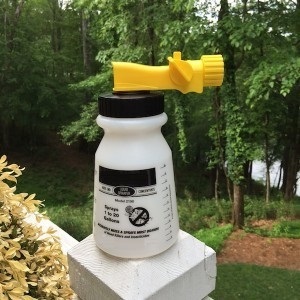 Add 25.5 oz of Cypermethrin to the sprayer tank and attach it to your garden hose. Use the entire tank to treat 100 sq/ft. For a flat area that readily absorbs the mixture, you can proceed without having to wait for it to dry. But if the ground is taking awhile to accept the chemical, its okay to let it stand for a few hours before continuing. When spraying, be sure to make a uniform and equal application across all surfaces where the liner will come in contact with dirt. Following the treatment, allow it to dry at least 2 hours before installing the liner. This insures the treatment is thorough and will protect the entire liner. Once dry, the treatment will have no impact on the liner or the pool infrastructure and if the treatment is done uniformly, you should get 10 years or longer residual. Since there are so many types of plants that may pose a problem to any pool liner, its best to use a soil sterilant and post emergent plant killer. PRAMITOL is such a product. It mixes with water, will kill all vegetation and will render all seeds dead so they cannot grow either. This means using Pramitol will take care of any and all stages of plant that may be developing in the ground prior to the liner being installed. Use 15 oz of Pramitol per 500 sq/ft of turf. Mix it with at least 1 gallon of water but if the soil readily accepts water, use more water. Do this by mixing 3 oz of Pramitol with 1 gallon of water per 100 sq/ft. The net result will be the same as long as you are distributing 15 of of Pramitol per 500 sq/ft of turf. Since so much less spray is needed for the Pramitol, any standard PUMP SPRAYER can be used to complete the job. In summary, termites present a real threat to pools and pool liners. Plants that grow once pools are installed can cause damage to sensitive infrastructure and seals. 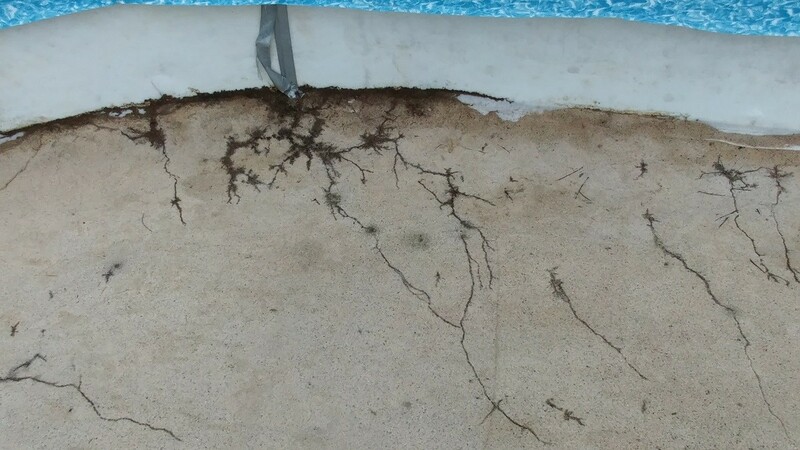 To make sure you don’t experience such damage, pretreat the soil around and underneath the pool with both a soil sterilant and a termite concentrate. This will insure a long life for your pool and its components. What do you do if they are found after the pool is up and the liner repaired? Not sure what you’re asking but hopefully one of the following responses will help clarify your situation. If you have a pool and the liner gets damaged by termites, before you install the new liner you need to treat the soil on which the new liner will be sitting. Failure to treat the exposed soil will result in the new liner getting damaged the same way your first liner was damaged. Now since termites are secretive and avoid light as well as any type of soil disturbance, during the process of changing out the liners you would not expect to see termite activity. This does not mean they have left the area never to return. It merely means they will be gone for the short term but no doubt will return once the new liner is in place and filled with water. So to avoid having them return and chewing through the new liner you install, it is suggested that treat the exposed soil you’ll see when the old damaged liner is removed. Simply apply the Cyper TC as explained above to the exposed ground soil, allow it to dry and then install your new liner without the fear of having it destroyed like your previous liner. Now if by chance you have already replaced the old liner with a new one and failed to treat, we recommend that some time in the near future you drain the pool, remove the liner and treat the soil as described above to prevent having the termites return. Hope this helps but if you have any more questions, give us a call toll free at 1-800-877-7290. I have an oval above ground pool 15 x 24. I wonder how much of Cyper TC I have to purchase to cover the area that needs to be treated? Based on the size of the your pool, you’ll need 1 gallon of Cyper TC. This will get you a solid 10+ years of protection. We were told if we apply 6 ml black poly to our pool walls and partial floor this will help control termites. Sorry but no, this will not help. In fact, pool liners are typically 20-30 ml thick and termites readily chew through this thickness no problem. Now if the 6 ml was a solid, yes, it would work. But at this time pools with liners rely on the flexibility of the liner as part of the pools design. And as long as that’s the case, the only way to protect a flexible liner will be to treat the soil prior to installing the liner. The good news is the treatment is highly effective and will last as long as the liner.